Since I had this wonderful housemade sake-kasu (sake lees) as a "byproduct" of making makkoli (rice wine), I wanted to use it for my donabe cooking tonight. We did a sake-kasu nabe hot pot! I made the broth with sake-kasu and cooked salmon filet and some vegetables I already had in the kitchen. For the broth, I also added my homemade miso. So it gives additional depth in the flavor and also more enzyme power! 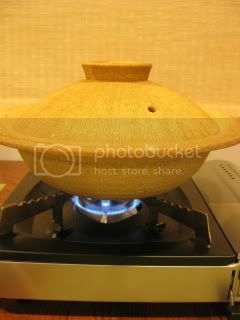 For this, I used my super light-weight handleless donabe, "Yu Kizeto". Unfortunately, the picture of the entire dish (in the donabe) came out too dark, so I just post the recipe below. It's very easy to make. 1. In a bowl, whisk together sake-kasu, miso, soy sauce, grated ginger, and a ladleful (or two) of the dashi stock. 2. Combine the whisked mixture and the remaining dashi stock in the donabe. Bring it to simmer over medium-heat. 3. Add the konnyaku, daikon, and carrot to the broth. Cook until vegetables are tender. 4. Add the fish and simmer. 5. Once the fish is cooked through, add the enoki mushrooms and mizuna. Cook for one more minute. 6. Serve into individual bowls. Enjoy with some condiments.